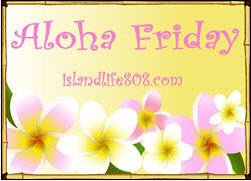 Greeting friends from soggy SE VA, I hope you are well and having a fabulous Friday! My question this week (with Earl on the move): What is the biggest storm or natural disaster you have experienced? The biggest storm or natural disaster I've experienced was Hurricane Floyd back in 1999 - I was living in Upstate New York at the time, and when the storm system reached the area, so much rain fell that it turned my driveway into a mini river - it was a steep driveway, and I parked on a level spot halfway up. The water was rushing just past the house I was renting and came precariously close to my car parked below. I couldn't go in to work that day - I took pictures and emailed them to my boss as proof that I wasn't making up the phenomenon. :) Once the water finally cleared, there was a huge crater in the driveway - about 4 feet wide and 8 feet deep. I had to carefully get my car around it and park at the bottom of the driveway until my landlord had the chasm filled. I was asleep when hurricane Gilbert passed through my country. When I woke up. As a child I was amazed at all the chaos but it waws fun to play. In July, when I was four (1969) I was in a tornado. Not really literally...but in the basement of my grandparents house and I heard the 'train' whistle and watched the whirling from the window. I LOVE storms!